Dispensationalism is one of the most widely held systems of theology among Bible believers in the United States.1 With this in mind, a study of dispensationalism is certainly called for by both the adherents and detractors of this system. Paul the apostle uses the word dispensation a number of times in his writings. Three which stand out are: 1) To refer to a future period of time. Ephesians 1:10 That in the dispensation of the fulness of times he might gather together in one all things in Christ, both which are in heaven, and which are on earth; even in him: 2) To refer to the dispensation of grace. Ephesians 3:2 If ye have heard of the dispensation of the grace of God which is given me to you-ward: 3) To refer to the fact that in dispensations mysteries are made clear. Colossians 1:25 Whereof I am made a minister, according to the dispensation of God which is given to me for you, to fulfill the word of God; 26 Even the mystery which hath been hid from ages and from generations, but now is made manifest to his saints: With this brief introduction let us take a look at the history of dispensationalism in America. Some argue that Justin Martyr (110-165), Irenaeus (130-200), Clement of Alexandria (150-220), Augustine (354-430), and other early church fathers all had dispensational concepts in their teachings. While an argument may be made that dispensationalism started with the early church,6 and while authors such as Ryrie7 contend that the Premillennialism of the early church runs parallel with dispensationalism, it cannot be argued that modern day dispensationalism started with the teachings of J.N. Darby and the Plymouth Brethren. After Darby’s death in 1882, the Fundamentalism movement adopted dispensationalism. This movement was a response of the believing church to the attacks of liberalism. Fundamentalism brought on the Bible conferences which had as a central theme, prophecy. 10 These conferences were dominated by the dispensational, pretribulational prophetic scheme, and thus Fundamentalism became, a dispensational movement. C.I. Scofield (1843-1921) produced his Scofield Reference Bible in 1909. This Bible was probably the greatest influence to the spread of dispensationalism in modern times. Scofield believed that the Bible could be understood by anyone if it was studied according to its dispensational divisions.12 Scofield’s dispensational definition and outlines have become the standard for contemporary American dispensationalism. 1) Pierre Poiret (1646-1719) – Infancy, Childhood, Adolescence, Youth, Old Age, Renovation Things. 2) John Edwards (1639-1716) and Isaac Watts (1674-1748) – Innocency, Adamical, Noahical, Abrahamical, Mossaical, Christian. 3) J. N. Darby (1800-1882) – Paradisical state, Noah, Abraham, Israel, Gentiles, Spirit, Millennium. 4) James M. Gray (1851-1935) – Ednic, Antediluvian, Patriarchal, Mosic, Church, Millennial, Fullness of times, Eternal. 5) C. I. Scofield (1843-1921) – Innocency, Conscience, Human Government, Promise, Law, Grace, Kingdom. 6) Finis J. Dake (1902-1987) – Innocence, Conscience, Human Government, Promise, Law, Grace, Millenium. Today Scofield’s scheme would be the most prevalent. Scofield taught21 the Scriptures divide time into seven unequal periods, usually called dispensations (Ephesians 3:2). These periods are marked in Scripture by a change in God’s method of dealing with mankind, or a portion of mankind, in the area of sin, and man’s responsibility. The dispensations may be regarded as a test of the natural man, and each ends in judgment-marking his failure in each dispensation. Dispensationalism is a simple way of looking at the history of man. The basic understanding of periods of time is common in our understanding of Scripture. That being said, dispensationalism is a positive and Biblical framework in which to view Scripture. 1 The Gospel According to Dispensationalism, by Reginald C. Kimbro, (Toronto: Canada, Wittenburg Publications, 1995) page 7. 2 Dake Annotated Reference Bible, by Finis Jennings Dake, (Lawerenceville: Georgia, Dake Publishing, 1963) page 59, O.T. 3 Oxford English Dictionary, (New York: Oxford University Press, 1933) Volume 3, page 481. 4 God’s Plan for Man, by Finis Jennings Dake, (Lawerenceville: Georgia, Dake Publishing, 1949) page 6. 5 Dispensationalism in America, by Norman Kraus, (Richmond: Virginia, John Knox Press, 1958) page 15. 6 A Bibliographic History of Dispensationalism, by Arnold D. Ehlert, (Grand Rapids: Baker Book House, 1965). 7 Dispensationalism Today, by Charles Ryrie, (Chicago: Moody Press, 1965) page 67. 8 Kimbro, The Gospel According to Dispensationalism, page 11. 9 Dictionary of Premillennial Theology, by Mal Couch, (Grand Rapids: Michigan, Kregel Publications, 1996), page 84. 10 Kraus, Dispensationalism in America, page 74. 13 Dake Publishing, P.O. Box 1050, Lawerenceville, Georgia 30046. 14 John G. Hall, Box 730, Newcastle, Oklahoma 73065. 15 Kimbro, The Gospel According to Dispensationalism, page 17. 16 Dispensationalism Today, by Charles Ryrie, (Chicago: Moody Press, 1965) page 44-48. 17 Couch, Dictionary of Premillennial Theology, page 94. 18 Ryrie, Dispensationalism Today, page 44-48. 21 Rightly Dividing The Word Of Truth, by C. I Scofield, (Neptune: New Jersey, Loizeaux Brothers, 1896) page 12. 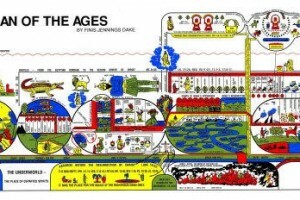 Three different sizes of the Dake Plan of the Ages chart available!